I remember what it was like as a mother of littles - in the quiet, when the day had been long and hard and I hadn't quite been the person I had hoped I would be, motherhood felt unbearably heavy. It felt a lot like drowning and a little bit like being buried alive. Sometimes I'd look around me and wonder why I struggled so much. I felt like I should be able to do all of this (and with a smile on my face!) but the reality of most days was that I felt more like crying. I was trying so desperately to be a good mom for my kids but I felt like I must be doing something wrong for this to be so hard. I remember feeling so lonely even though I barely got a minute alone. I remember feeling utterly exhausted emotionally and at the same time bored out of my mind. I felt trapped at the same time as I felt like there was no place I'd rather be. I felt like I was doing both the most important and the most meaningless work. I was scared to death that my kids would grow up, turn to point an accusing finger at me, and list all of the ways I had failed them as they were growing up. 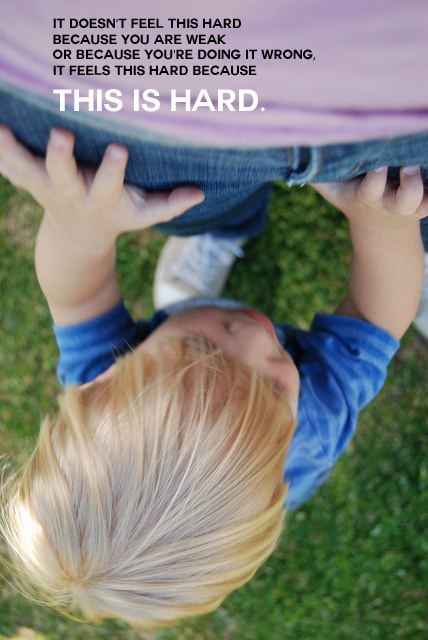 Dear Mother of Littles this season is so hard. It is just really really really really really (shall I keep going?) really really hard. It is so hard to have little people crying, screeching and whining at you all day long. Those moments when everyone is happy and things are running smoothly are just too few and far between. It is so hard to deal with the pressure of the sleep training and the potty training and the everything-else-training every waking moment (and a lot of the moments when you should be sleeping). It is so hard when sleep deprivation stretches out beyond days or weeks into years. And why on earth does it have to be so hard just to do something as simple as empty the dishwasher?! It is so very hard when it feels like no one else in our little home really understands how brutally hard theses days usually are. But sweet mama, please hear this, because it took me altogether too long to learn this for myself. It doesn't feel this hard because you are weak or because you're doing it wrong, it feels this hard because This Is Hard. We all struggled through this season. Some of us coped with the struggle by writing or photography or craft projects or going places with our kids. Some of us coped by trying to keep our houses clean, some of us coped by giving up on housework completely. Some of us coped by exercising a lot, some of us gave up on exercise completely for awhile. Please don't judge your inside by somebody else's outside or your weakness against another mother's strength. Eventually your little one is going to be able to do the most amazing things. They are going to grow up and be able to make you a sandwich and help you remember where you left your shoes. They are going to sleep all night in their own bed, every night. They will help you with that mountain of laundry you can never quite conquer. And eventually you are going to set aside those Dora the Explorer DVDs (or Paw Patrol or whatever it is the little kids are watching on Netflix these days) and the two of you are going to go see that movie that just came out that is based on the book you both read and it is going to be amazing. Dear Mother of Littles - you are going to be okay. You are going survive this season and head into the next one better and stronger for it. I know there are moments when you wonder if you have what it takes to get through this. You do. This is a season of intense sowing but right around the corner you'll finally start reaping the first little bit of a harvest and it is going to be so satisfying. Keep your eyes open for it. Don't miss it. He is eventually going to walk right along beside you without fighting you every step of the way, and she is going to show so much compassion for a sibling or a friend that it is going to melt your heart. You are going to watch her do something you thought was maybe too hard for her and you are going to witness his intelligence and curiosity. Eventually, she is going to sit up in the front seat and talk about the way she sees the world and it is going to blow your mind what a smart, kind person is growing up next to you. Right now you can only barely imagine what incredible young people these little kids are going to become. I know you might have an idea in your head - but take that, multiply it times ten and maybe you are in the same neighborhood of how awesome your kids are becoming. They are going to be real people, with their own quirks and irritating behavior and weaknesses and struggles. They are going to drive you crazy sometimes, and sometimes the parenting issues you are going to face with them are going to knock the wind out of you for a minute. But not every day, and definitely not in the rapid-fire way that it is when you are home with little ones. Dear Mother of Littles - what you are doing now matters. The way you hug her when she falls, the way you encourage him to try again, the way that you walk around in the world and talk to your friends. The way that you encourage, challenge, and correct your sweet littles matters. Eventually you're going to visit your child at school or bump into other older kids at the park and you're going to see what it does to a child to not have a parent who is nurturing, and you're going to realize all over again that what you are doing now matters a lot. It might not feel like it in the moments - all of these hours of nursing and bottles and diapers and walking around with spit-up on your shirt, or peanut butter and jelly sandwiches and legos - they usually feel like nothing in the moment. These ordinary moments seem like the spare change that falls into the couch and isn't missed, the pennies that we pass in the parking lot and don't bother to stop and pick up. 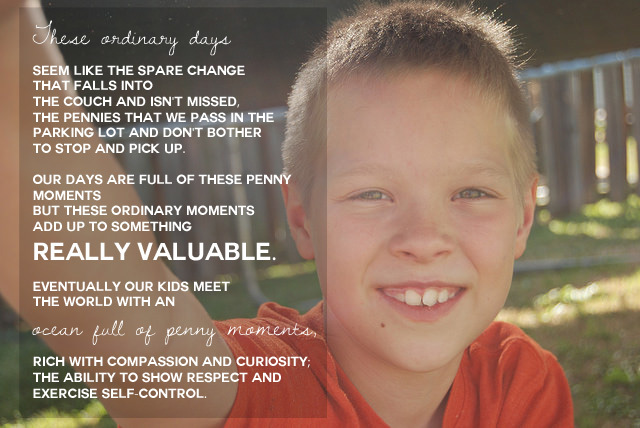 Our days are full of these penny moments - but these penny moments add up to something really valuable. Eventually our kids meet the world with an ocean full of penny moments, and they are rich with compassion and curiosity; the ability to show respect and exercise self-control. I know that these days feel long, hard, and sometimes suffocating. I know that sometimes each season feels like an entire lifetime. I know that sometimes it is infuriating, the way that just as you were finally settling into a rhythm your baby grows and changes, and your routine has to grow with it. I remember how hard it was during those first few years after they started school and how it felt like maybe now nothing in my life was ever going to change again ever. And I know that mothers with older kids, like me, sometimes say annoying things about how much we miss the baby years or how fast these years fly by. Sometimes we complain about how hard the teen years are and try to compare our struggle to yours. Ugh, just to all of it, ugh. But when I stop to remember what it felt like for me, as a mother of littles, all I just want to say is - you are doing the thing the that matters most. Your imperfect mothering is enough and you are doing a good job. I don't think you can even know right now, from the place where you sit on the floor with your kids, what an amazing thing it is that you are doing. And I love you for that. 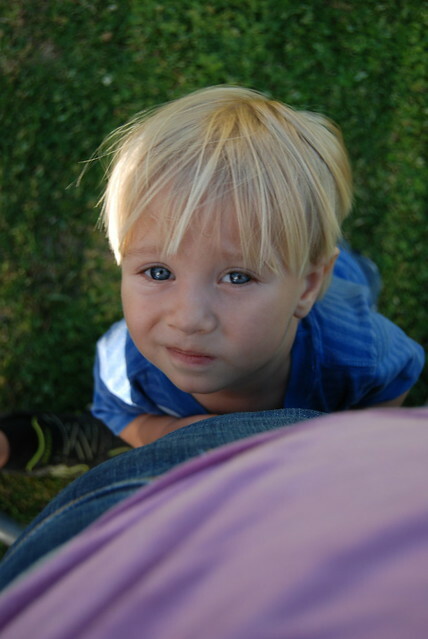 My friend Jessica recently re-posted a link to this post where she asks the moms of the not-so-littles to remember what words mamas of littles really need to hear (and what is less helpful). She is deep in the trenches of motherhood, in the struggle of the static-hold-hard of the elementary school years - the day after day after day of lunch boxes to pack, car lines to wait in, and homework - wash, rinse, repeat. She does not want to hear that the teen years are even harder. It's just not helpful. I had another conversation recently, with my friend Bethany, that went along the same lines. She has two kids under three, her days are long and hard and she confessed that when other moms say things like like "you'll miss this one day" and "these years fly by" or "cherish every moment!" that she doesn't feel any better. It's just not helpful. So I am starting a hashtag on Instagram where I'll be writing encouraging notes to those who are just beginning their journey of motherhood and I'm calling it #DearMotherofLittles. I'm also offering this hashtag to you - what did your younger self need to hear? Tag your note #DearMotherofLittles. Now that you have made it around the bend, would you pause for a moment to glance back and leave a love note for those who are on their way? Use the hashtag #DearMotherofLittles and feel free to join in wherever you show up on social media.